It is a former family home that was transformed into a Guesthouse licensed by the Turism of Portugal (AL 3622). Upstairs are four double rooms, one single room, three bathrooms, kitchen and lounge with internet use for guests. 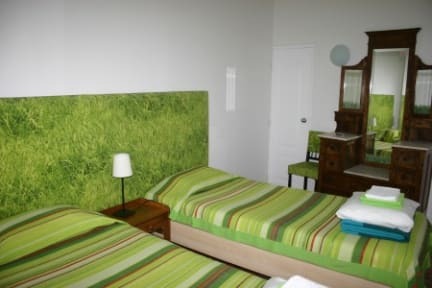 We have two rooms with double beds, two with twin beds (standard twin private) and one with a single bed. All our rooms are for 2 guests except the single one. After a few months closed, Casa das Laranjeiras reopened greener with solar energy and other sustainable solutions. Cash only accepted as payment upon arrival, we do not accept credit cards. Wonderful place to stay! I undoubtedly will stay again in the future! Really beautiful place to stay for a good price if you are looking for a more quiet night/ atmosphere. Lots of room to cook and we were able to check in early. Nice and centra but little hard to find but the description of the location helps. Loved our stay here. Great location, comfortable accomodation and very friendly and helpful host. We would return! Great place to stay . it is located directly in the center of the old town, yet it remains very calm inside. It is not a party guesthouse, so it was perfect for us. Bathrooms are clean, kitchen is well organized. We had 2 flights of stairs to climb to get to our room, that might be an inconvenient to some. Overall, would stay again. Casa das Laranjeiras is a great place to stay if you want to be right in the centre of town, surrounded by all of the action. This means it is not the quietest at night due to street noise but we were fine. 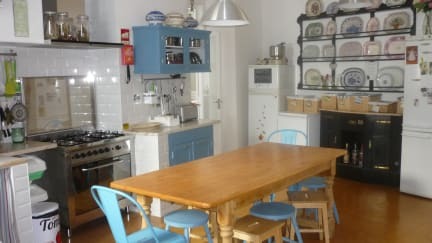 The kitchen is very well equipped, so very easy to cook in, but there are also tonnes of restaurants just out the door if you don't fancy cooking. There are lots of things available for you to use such as umbrellas to take to the beach. The whole place was extremely clean the entire time. Casa das Laranjerias is beautiful. It’s a home, for sure, beautifully decorated. My main issues with the place: 1. The room I slept in (standard twin private, so two twin beds) was horribly uncomfortable. Painfully uncomfortable. 2. There were ants everywhere, in everybody’s room. 3. It’s a beach town, so it’s sandy everywhere, but they don’t always sweep the floors in the guest rooms. 4. WiFi didn’t work in my room. While the facility was kept well clean, there were ants everywhere. We ended up with ants in our luggage to our next town.